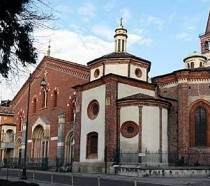 The stunning Portinari Chapel, one of the greatest examples of Renaissance in Lombardy, its sumptuous frescoes by Vincenzo Foppa, the greatest Renaissance painter in Milan before Leonardo Da Vinci’s arrival in the city. The Museum of Saint Eustorgio near the Basilica, the Cemetery and Christian Necropolis and the Three Wise Men (or Kings) relics! Saint Eustorgio, bishop of Milan from 344 to 350, brought in fact the Three Kings relics from Constantinople to Milan: they originally were supposed to be buried under the Duomo of Milan, but the oxcart transporting them misteriously stopped at the actual Church of Saint Eustorgio which was erected after this event in IV century. All this is today visitable right in front of Hotel Milano Navigli, in the Basilica (Church) of Saint Eustorgio. A magic place in the same square of our Hotel!